A grand, Soviet-era monument complex (and small museum) dedicated to the commemoration of the defenders of Leningrad, today's St Petersburg, during the WWII Blockade of the city by Nazi Germany. More background info: for the historical background of the Leningrad Blockade as such see under “Road of Life” tour and under Leningrad Blockade Museum. 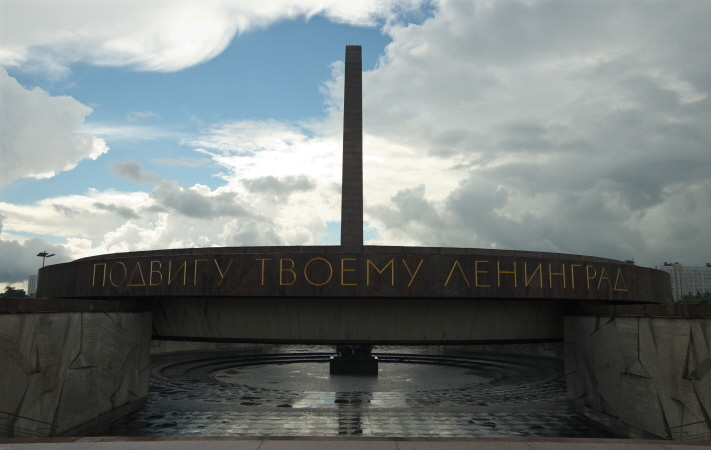 While the latter was originally set up immediately after the siege ended but was closed down again by Stalin just a few years after the war (only to be reinstated in 1989), this monument was first thought up long after Stalin's death in 1953. It all began with the reconstruction of the square it sits on in the early 1960s. Since then it has been known as Ploshchad Pobedy ('Victory Square'). The same architects who designed the square and the tall buildings that surround it, and had also played a role in the post-war reconstruction of Minsk, later also led the team who designed this monument. This was inaugurated in 1975. The Memorial Hall underneath the square opened in 1978. What there is to see: Many a visitor to St Petersburg will pass this monument as one the first things they see of the city, namely if they're on a transfer by bus or car from Pulkovo International Airport to the city centre. 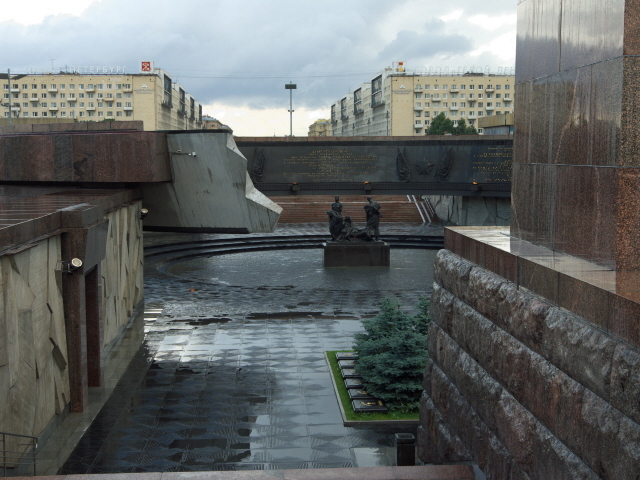 But to see the monument properly you have to make your own way here by metro (see below). The other main element is a large ring around a hollow which is the main outdoor memorial space. The ring is “broken” on its south-facing side (where the main needle stands) as a symbol for the breaking of the blockade ring around Leningrad in 1944. At the centre of the circular hollow inside the ring is a group of sculptures of a machine-gun-armed man and several civilians, including a woman holding her dead (presumably starved) child in her arms. It's really quite effective. 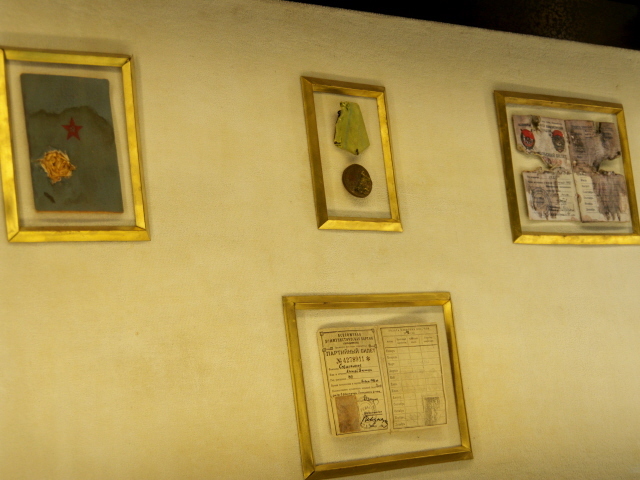 On the inside wall of the ring are various inscriptions in golden letters as well as a set of eternal flames and reliefs of coats of arms and flags and five-pointed Soviet stars. The other “hero cities” of the former USSR (including e.g. Kiev, Minsk, Murmansk and Volgograd) get a mention too in the form of a dedicated set of memorial stones. Outside the ring and south of the main needle are a set of further groups of sculptures, depicting civilians helping in the fortification of the city, or on the “home front” (making ammunitions), or soldiers setting off into battle, some still embracing their loved ones they are leaving behind, others already on the move waving guns and flags. Halfway down towards the centre of the ring is the entrance to the Memorial Hall, which is underground, below the square. This is the part you have to pay for to get in (see below). 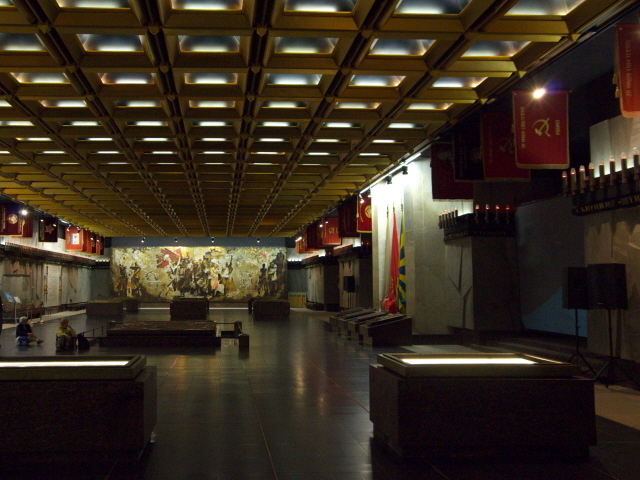 Its design is fantastically Soviet in style too, involving some 900 candle-like lamps along the walls (symbolizing the days of the siege) and two huge mosaics at both ends of the main hall. When I visited a group of (I think American) tourists was there watching a film on a large screen featuring footage from the days of the siege and the battles for Leningrad. Whether this film was specially put on for the group or whether it runs regularly I don't know. I had seen some of the footage before elsewhere, so I paid only partial attention to it here. 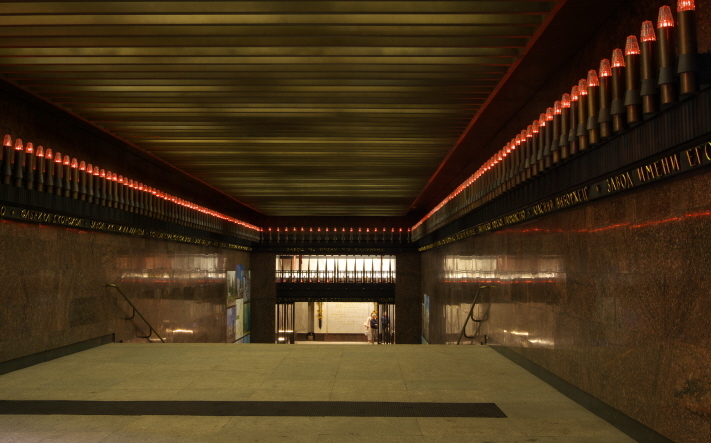 The intense memorial design involves plenty of gold, marble, flags and symbols, as well as a relief map of the Leningrad area in the centre of the hall, on which lines of little red lights depict the shifts in the front lines during the battles for the city. In addition there are also a dozen or so display cabinets. And all of these come with a bilingual (Russian and English) text panel with some explanations. On display inside these cabinets are several artefacts including documents, ID cards, letters, ration cards and objects such as helmets, guns, shells, a violin and vinyl records (the latter for keeping up morale, I would guess). Perhaps the most moving part is the display of a meagre daily bread ration that each citizen had to survive on, ca. 125 grammes! On a wall on the way out I also spotted a set of photos of other monuments that ring St Petersburg and are lined up all the way up to Lake Ladoga along the “Road of Life”, which I was about to see for real on my Leningrad-Siege-themed tour later that same day. On balance, I found this Monument and its small but fine exhibition more intense and moving than the Leningrad Blockade Museum in the city centre. The Blockade Museum, I felt, concentrated too much on the military aspects. Here at the monument, the focus is also on the glorifying, stunningly executed in superb Soviet-era artwork and sculptures as well plenty of rather pompous symbolism, but it also had interesting displays, including plenty on the plight of the civilian population during the siege. Well worth the excursion from the city centre. Location: in the centre of Ploshchad Pobedy ('Victory Square'), which is some 6 miles (10 km) south of the city centre of St Petersburg, Russia, right at the bottom of the long Moskovsky Prospekt, and a slightly shorter distance north-east from the city's Pulkovo International Airport. Access and costs: far from the centre, but quite easy to reach by metro and a short walk; the monument is free to see, the Memorial Hall museum part charges a small admission fee. Details: thanks to the metro the monument can be reached with relative ease: take the blue line (2), e.g. from the central Nevsky Prospekt station, south to Moskovskaya and get out at the southernmost exit. From here it's a 5-10 minute walk further south to the end of Moskovsky Prospekt. The monument as such can be visited at any time and for free. But the Memorial Hall and exhibition have the following opening times: Thursday to Tuesday 11 a.m. to 6 p.m. (only to 5 p.m. on Tuesdays), closed Wednesdays and the last Tuesday of the month; ticket office shuts an hour before closing time. Admission: 150 RUB (guided tour 700 RUB for groups of 1-15 participants). Time required: about 10-20 minutes for the monument itself and maybe half an hour to an hour for the Memorial Hall underneath the square, depending on whether you want to watch the film in its entirety or not. Combinations with other dark destinations: Just up the road, the grand Moskovsky Prospekt, the best example of Stalinist architecture in this otherwise so European-looking city can be found – the former House of Soviets. In front of it stands the city's most flamboyant Lenin statues. See under St Petersburg, also for photos. Other than that there's only some more functional Stalinist architecture, but for proper dark points of interest you have to head back north towards the centre. Combinations with non-dark destinations: Ploshchad Pobedy is far from the touristy heart of old St Petersburg and there isn't much of general tourist interest around here in the south of the city, except perhaps Pulkovo Park with its cluster of (rather unremarkable) churches to the south-east of the square. Not too far away, however, about a mile up Ulitsa Lensoveta, the boulevard running parallel to Moskovsky Prospekt to the east, is one of the most celebrated gems of ecclesiastical architecture in the city: the Chesme Church with its characteristic white vertical stripes on its pink façade, so it looks vaguely like it's made of matchsticks.